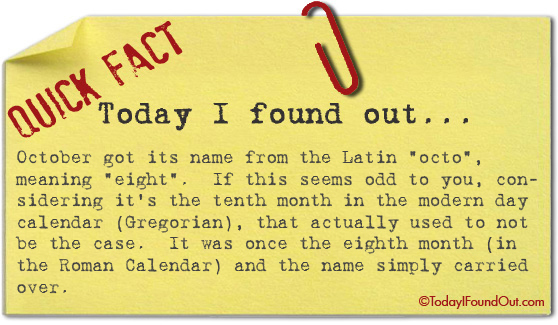 October got its name from the Latin “octo”, meaning “eight”. If this seems odd to you, considering it’s the tenth month in the modern day calendar (Gregorian), that actually used to not be the case. It was once the eighth month (in the Roman Calendar) and the name simply carried over. In addition, the reason Sep, Oct, Nov and Dec became shunted up two positions (from 7th, 8th, 9th and 10th to 9th, 10th, 11th and 12th months) was because two Roman emperors wanted months named after themselves. Thus two additional months were inserted in the middle of the year: July, named for Julius Caesar, and August, named for Augustus Caesar. I think you better get your facts right. ‘OCTO’ in Latin meant nothing. ‘OCTO’ in Ancient Greek means ‘eight’ – Latin borrowed a great deal of words from the Ancient Greeks. ‘OCTO’ even today means eight in Modern Greek whilst in Italian (modern Latin) it is Otto.